Thanks to the attention my paper on the cost of Somali piracy has received, a lot of people have approached me to ask how I computed the maritime routes. 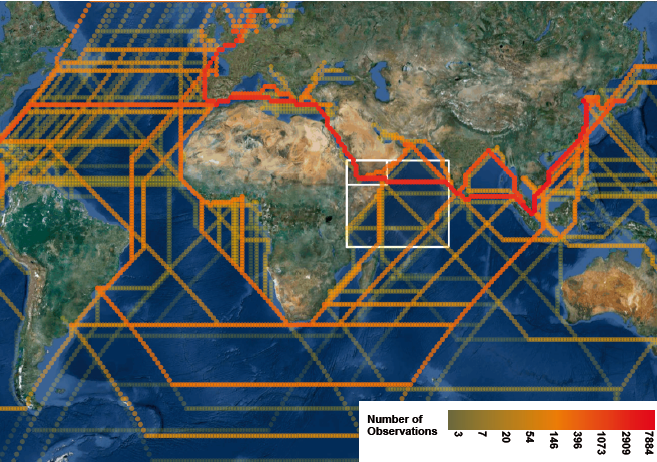 It is not a very difficult task using R. The key ingredient is a map of the world, that can be rasterized into a grid; all the landmass needs to be assigned an infinite cost of crossing and last but not least — one needs to compute the actual routes. The package gdistance does most of the actual work of computing the routes. The wrld_simpl map provides what is needed to generate a raster. After the raster is generated, we can proceed by making landmass impassable for vessels. There are a few more things to do, such as opening up the Suez Canal and some other maritime passages — one needs to find the right grid cells for this task. In the next step we can transform the raster into a transition layer matrix, that comes from the gdistance package. It is a data construct that essentially tells us how one can move from one cell to the other — you can allow diagonal moves by allowing the vessel to move into all 8 adjacent grid cells. There is also a geo-correction necessary, as the diagonals are longer distances than the straight-line moves. Well — and thats basically it — of course, there are a few bits and pieces that need additional work — like adding heterogenuous costs as one can imagine exist due to maritime currents and so on. Furthermore, there is a whole logic surrounding the handling of the output and the storing in a local database for further use and so on. But not to bore you with that — how can I obtain the distance between A and B? This uses Dijkstra’s Algorithm and is called through the gdistance function “shortestPath”. We are working on finalizing our paper on Somalian piracy and the effects on the shipping industry. We believe that our paper is the first serious attempt to identify the cost of piracy using a novel dataset and a novel approach. We find that the direct and indirect cost may be between $ 1.8 – $3.0 billion. This is a lot of money compared with the mere $150 – $250 million that the piracy activity generates for the pirates. This highlights how large the welfare gains from having a functioning state with working institutions and an established monopoly of power can be. Clearly, the paper is not capturing all the adjustments that are taking place. In particular, we find that local and regional trade is a lot stronger affected by piracy then, e.g. trade from Asia to Europe. This suggests that the piracy burden is especially born by regional economies, such as Yemen, Kenya, the Seychelles and so on. This got me thinking and I started looking at the impact of piracy on the fishing industry — I first started off with Yemen, however, the data quality is very poor. 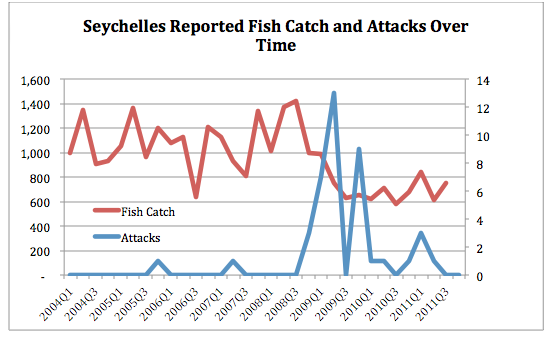 Here is something very primer…The graph depicts quarterly reported fish catches by the Ministry of Fisheries of the Seychelles and the number of piracy attacks in the vicinity of the Seychelles (roughly in a radius of around 500 miles). Do we believe that the rise in piracy was causing this drop in fish catches, which appears to be persistent?